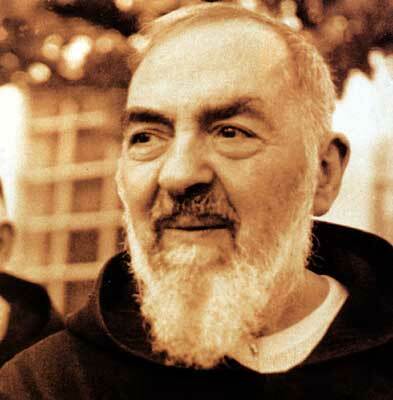 Today, September 23rd, is the feast day to honor Saint Padre Pio. Born, Francesco Forgione, in 1887 in a small Italian village to a poor and devout Catholic family. He had a calling at a young age to live a holy life, and joined an order of Capuchin friars at the age of 19. 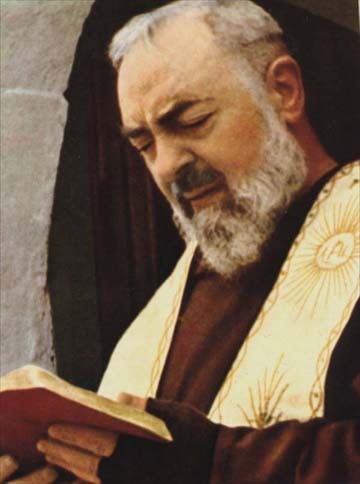 Padre Pio struggled all his life with health difficulties which was a burden he bore with great humility and strength. While praying before a cross, he received the stigmata (the wounds of Christ) on September 20, 1918, the first priest ever to be so blessed. During his lifetime his stigmata and miraculous healings he performed were doubted–even by some in The Vatican. He was also said to have been gifted through God with the powers of bilocation, levitation, and healing by touch. One of the great stories of WWII included that German bombers flying a mission were forced to abandon their mission, when in their astonishment, saw Padre Pio flying in the clouds forcing them to turn around. Padre Pio was also known to have incredible sessions of offering the sacrament of confession where he knew if people were truthful and knew how to bring about a healing penance. It was Pope John Paul II that canonized Padre Pio on June 16th, 2002 in Rome.